To the average person ‘polymer’ brings to mind images of rubbers and plastics. They are indeed polymers , but only a small number of examples. One of the most intricate collections of polymers has to be biological life forms like you, me, animals in general as well as plants and single-celled biological systems. Proteins form most of the solid mass of a human body and every single one of them is a protein. The way a single cell functions is that it stores the information needed to form protein polymers in the form of deoxyribonucleic acid (DNA). DNA consists of two long polymers of simple units called nucleotides, with backbones made of sugars and phosphate groups joined by ester bonds. Attached to each sugar is one of four types of molecules called nucleobases, cytosine, guanine, adenine and thymine (C, G, A, T respectively). During transcription of active (uncovered) genes in the DNA these nucleobases are transcribed into strings of ribonucleic acid (RNA), whereby the thymine is exchanged for uracil (U). These RNA strings are referred to as messenger RNA (mRNA). These mRNA strings are used as the template by the polymer synthesis engines of the cell: the ribosomes . This process is known as translation. Each three nucleobases in mRNA, called a codon, encode one type of amino acid, or monomer. The thus encoded monomers will be assembled in the specified order by the ribosome. 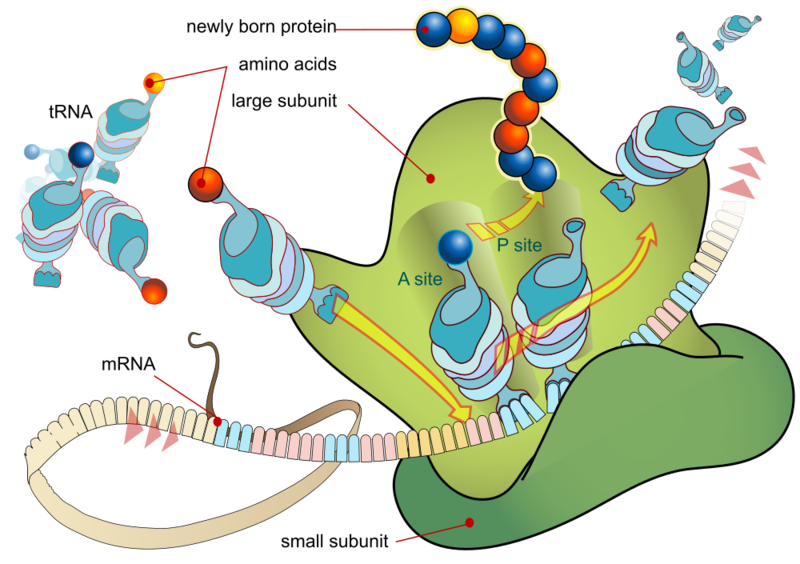 It first latches on to the mRNA string, then runs across it whereby it uses transfer RNA (tRNA) which has a complimentary anti-codon on one end and the matching amino acid on the other end to assemble the resulting polymer string. After translation the polymer string usually undergoes structural changes (folding) as well as some chemical modifications. This results in the final, functional protein. It’s quite a nice example of how to construct a storage and translation/synthesis unit out of only polymers. It also contains the basics of where medical science is taking us. More and more often we end up fixing issues in medicine on a protein level, whether it concerns cancer, Alzheimer’s or similar diseases whereby something went wrong during the above process. Protein synthesis and design of custom proteins also forms the basis of two exciting new developments, namely in improving an existing body and in creating a cell and ultimately a body from scratch. Additionally there is the possibility of tapping into this system and modifying it to link it up with, say, a computer. Imagine if the polymer structure wasn’t stored in DNA, but in a computer, and didn’t use mRNA, ribosomes and the like for translation into proteins. What if a different unit than a ribosome was used to assemble the amino acids, for example by presenting the proper receptor at the right time to coax the two amino acids to be matched together? It could thus simulate the functioning of the tRNA molecules while presenting a direct link between the digital design and the resulting string of amino acids. It could be used universally for any type of monomer, really. Designing a protein is hard because its functioning is based on its 3-dimensional structure and functional units presented to external receptors and molecules. The polymer design language I’m working on at this point has to find the proper links and simulation accuracy to allow one to describe a functional 3D polymer which can then be unfolded into a 2D string and sent to the aforementioned translation unit. I hope to present more details on this Polymer Design Language (PDL) and the associated synthesis tools soon, including hopefully some examples and simulation results in GROMACS  or similar. Until then.